2.95 points at 20 votes (rank 855). 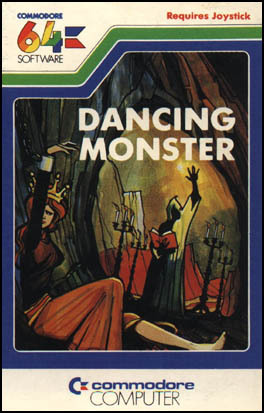 A beautiful princess was turned into a monster and additionally forced to dance for eternity. Now you have the task to free her from the "additional parts" with your magic missile. 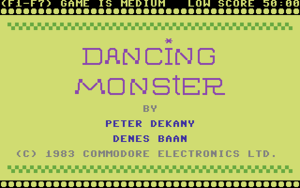 The player's task is to disassemble a dancing monster by pointing with the joystick to the corresponding body parts and pressing the fire button. After that the corresponding body part disappears. In the upper left corner, the computer shows which part is currently required. You need to start with the horns (HRN), then go in with the ears (EAR), and so on. 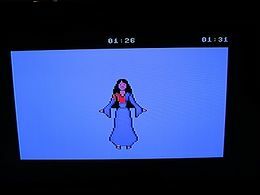 If the player waits too long, clicks off target or the wrong body part (=one which has not been in the requirement yet), then a disappeared part grows back. In between the monster tauntingly sticks its tongue out to the player. The monster is funnily designed, but the animation is very jittery. There is no background and the course of motions repeat. The music is monotonous and rather creates boredom. In the C64 emulator (e. g. VICE) simply adjust the maximum speed via "OPTIONS" to 50 or less and quietly click the body parts away one after the other. Sledgie: "Basically, the game idea is quite funny. In practice (my four-year old son has tested) the game failed. The motivation is only very short, it gets boring very quickly. The music gets on your nerves." mombasajoe: "No comment. This is the first "game" that I have played through in my first try... and in the second try below 1 1/2 minutes. Not kidding. No cheat. No game. Only trash. Added to this is an awful sound and jittery images. No, thanks. Enough." The fastest time wins. So the one that is faster than "mombasajoe" reaches the first place. This page was last modified on 24 April 2019, at 10:00. This page has been accessed 2,078 times.